More than 100 of Victoria's best female footballers have begun preparations for the 2017 launch of the AFL's national women's league, giving them access to elite training facilities and coaching. The players will take part in a nine-month training program at the AFL Victoria Women's Football Academy, which is similar to that offered to elite underage boys in the TAC Cup system. While the exact details of the women's league is yet to be finalised, it is expected that between six and 10 clubs will take part. AFL Victoria female football manager Darren Flanigan said that would require more than 200 players competing at a high standard. "We'll devise a program around ... the conditioning side of things, psychologists, dieticians, wellness, as well as all the football skills that need to be taught and the game sense," he said. "It's a fairly comprehensive program and hopefully the players engage in it. "There's probably 30 or 50 players who can all kick, mark, handball, are athletic and understand the game really well. It's just a matter of getting the next 50 or 60 up to that standard. The buzz around women's football has been quite strong in the last six months. "So teaching them properly, teaching game sense, defence, attack, transition, all that stuff we've been teaching the boys in the TAC system for a long period of time. "To be now able to impart that knowledge on the players in the women's academy is great opportunity." Mr Flanigan said the academy had been given access to coaching staff, training and rehabilitation facilities at a number of Melbourne-based AFL clubs. 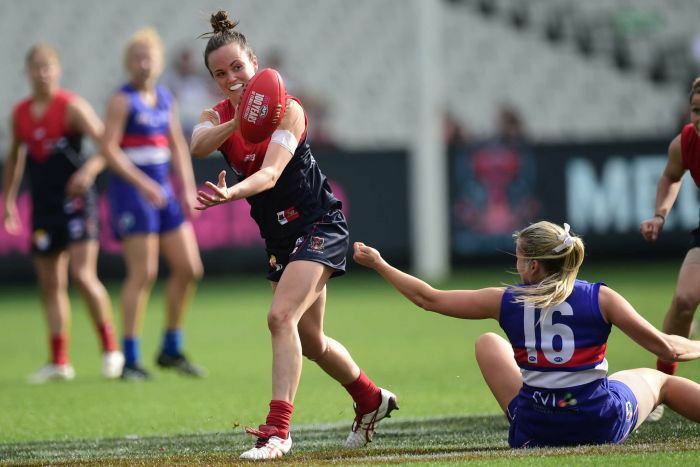 The Melbourne and Western Bulldogs women's teams played off in two matches, including a curtain-raiser to the men's game, during the 2015 season. Mr Flanigan said the creation of the national league in 2017 was the start of an exciting time for women's AFL. "The buzz around women's football has been quite strong in the last six months, and the exhibition game that was telecast on free-to-air TV got really good ratings," he said. "It's just going [from] strength to strength."